The experience of water management in California has not been all positive. Some critics have attributed California’s land, water, labor, and environmental problems to “immense centralized institutions” ruled by oppressive bureaucratic elites who have manipulated water resources in their own self-interest. There is some truth to that, but the reality of a war of fragmented authorities contradicts some of that. “That is confusing,” Theo thought, as he was in the middle of the book: The Great Thirst (page 547). It reminded him of what Senator Wolk had been fighting for, in California. She submitted a law, or what she hoped would become law, limiting the drilling of new wells for irrigation. The ground water levels are going down at an alarming rate, especially in the Central Valley. Water consumption in California way outpaces the amount replenished through rainfall and snow, that melts in the Spring and is collected in reservoirs. California water rights are still based on the old rule that groundwater is accessible to any grower, however deep he has to drill, limited only by economics. Surface water is something else. Only the land owner through whose property a river is flowing, has water rights to that water, as much as he needs. The governor can put limitations on surface water use, but not on ground water consumption for irrigation purposes. Theo had mixed feelings about that. He was fortunate to live in Northern California, where there was enough water for farming operations, but his farm friends in the Central Valley had to rely on a lot of well water. The law did not pass, because the Farm Bureau was able to put a stop to it. This was the same Farm Bureau that had been so helpful to Theo over the years. This issue was going backwards on water consumption in California. There is no all-encompassing program on water consumption and water allocation in California. It is all these “immense centralized institutions” making it impossible to have a uniform water policy. What reasons did the Farm Bureau give for fighting the limits on new wells? They would not say, except give some vague response, like: “Who will grow food for the population, if water was not supplied in sufficient amounts?” If the farmer had to pay the real price of water, they would not grow tomatoes, plant almond trees, and the like. That land would require other purposes. It reminded Theo about what happened in the Klamath Valley Basin. 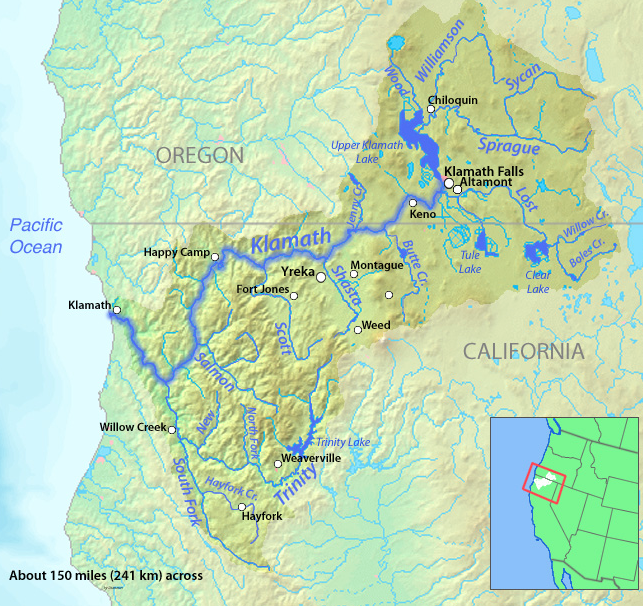 The Valley Basin is a semi-arid section of Oregon, that receives relatively little water. Ground water was plentiful, at one time. Farmers, settling there, by the middle of the 20th century were feeling the pressure of an increasing population, and industry needing more water. The area had been known for being the 2nd largest salmon river after the Columbia. For Indians the land also represented an ancient, sacred, and spiritual inheritance. It became clear that the natural flows would not be enough to satisfy all parties; farmers, Indians, industrialists, and growing population. About every 6-7 years or so, an extreme drought would make it really hard to allocate the water. Volatility between parties became understandable. Farmers succeeded to have the federal government build four power generating dams that helped light up the area, blocking the salmon from swimming up stream to lay their eggs and pumps churning up the fish that came back down the river. Feeder lakes were drained to make arable land. Later the power generators were not needed anymore, but the damage was done. Then in the mid-nineteen fifties, the federal government, as part of its efforts to assimilate the Indians, duped the tribes into selling off their land, leaving them without a home, overlooking one important provision in the 1864 treaty: It allowed tribes to hunt, fish and gather on their former lands. This included retaining their water rights, so the farmers found themselves as second in line. Beyond that, the “sucker fish” had to be protected which caused a lot of small farmers to go bankrupt. Theo could imagine the arguments and bad feelings that created among the Valley Basin constituents. You would have a pickup full of teenagers going through town, shouting obscenities at the Indians they encountered, derogatory comments, putting bullet holes through signs in front of businesses. At one point, during a drought, the President allowed the release of water to save the salmon, but it was too late. The water was too warm for salmon to survive. The government tried, but only provided temporary relief, and was too far removed to understand the battles and history of water provisions for Oregon and California. Enter Jim Root, a newcomer to the Medford based fruit export business. He bought a farm which had a river running through it, so had one of the oldest water rights available. But that did not exclude him from seeing the water wars and pain around him. He had more water than he needed. The water spread out over his pasture land, was not the most economical use. Jim’s conscience played a role in deciding to not irrigate for pasture anymore. This provided people downstream access to more water. His decision did not go unnoticed by the Indians, and he gained their respect. Not only the tribe, but also his neighbor, a rancher noticed it and soon the two became friends. They both saw how big the problem of the water shut-off was and they tried to figure out a way to solve it. Thomas, the neighbor, had a good standing with the ranchers and Jim had the respect of the tribe. Actions that consider the entire community. Balance the flow of water in- and out- of the community.